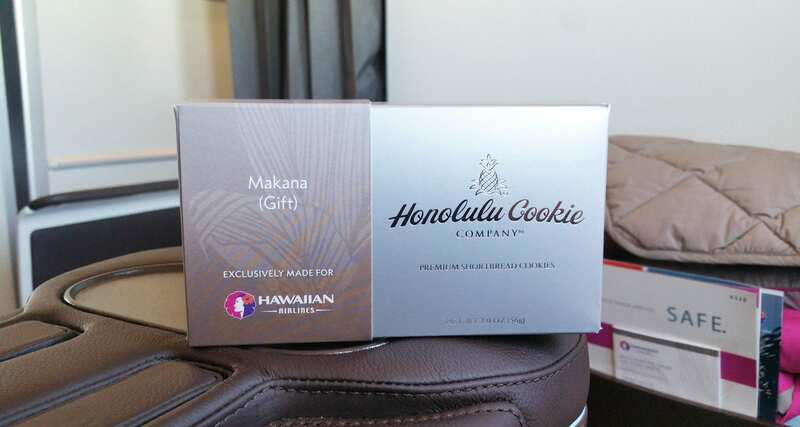 I was looking forward to testing out Hawaiian Airlines, I’d heard great things about them and their inflight service. Instead of getting to Hawaii from Europe to the USA and then continuing onto Honolulu, I decided that I would fly through Asia instead. 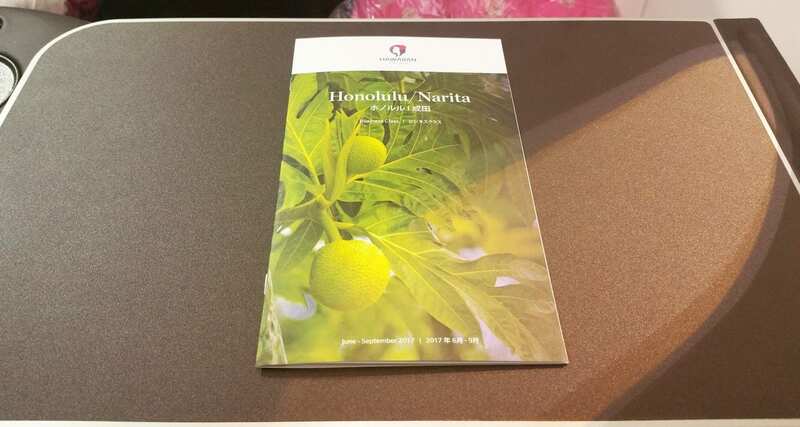 I flew from Paris to Tokyo, and then connected with Hawaiian Airlines from Narita to Honolulu; I chose Narita as I knew they would be offering their new business class cabin. 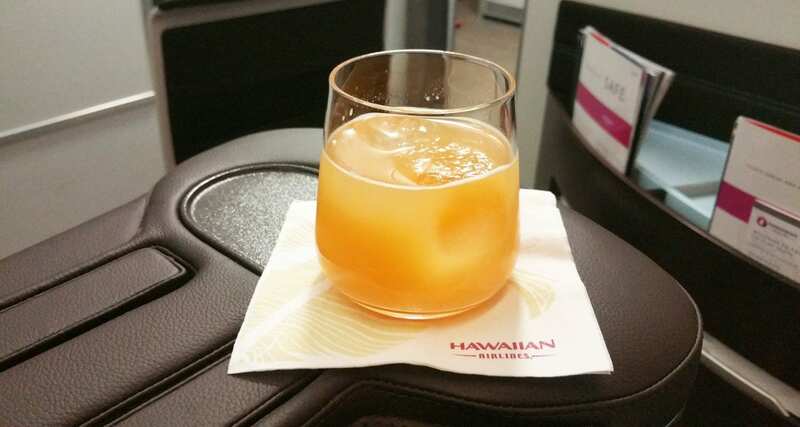 On Narita flights Hawaiian work with Chef Lee Anne Wong from Koko Head Cafe in Honolulu, and together they create an exquisite fusion of Japanese and Hawaiian flavours. 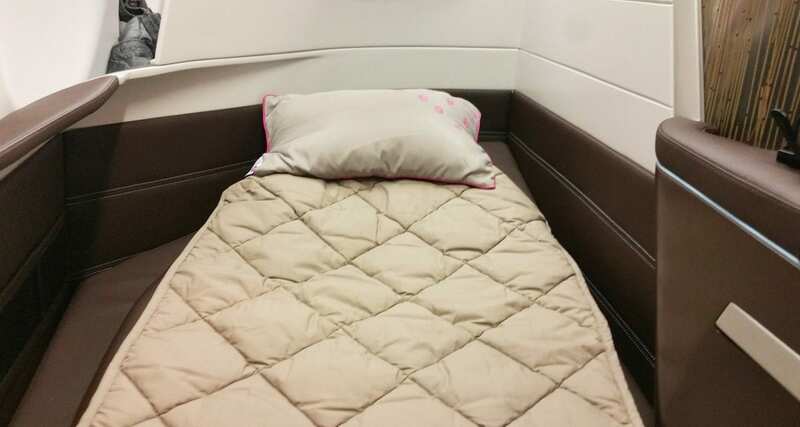 The flight time was short just over 7 hours, and as soon as I boarded, I knew it would be a great flight — a friendly warm welcome from the crew, coupled with a beautiful looking cabin. It already felt like I was in Hawaii, not many airlines can pull that off, kudos to the staff on this flight. As soon as I settled in a cabin crew member came over to introduce himself, offered me the inflight menu and a choice of a welcome drink. On offer were a range of juices and their signature Mai Tai, I opted for a juice. 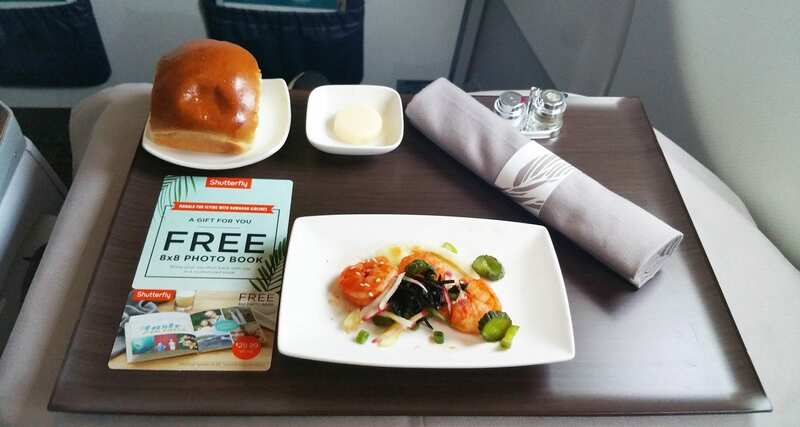 Here’s a look at their printed inflight menu. Braised Chicken with Miso-Adobo Butter, Salted Fish Kamameshi and Sauteed Green Beans. Fresh fruit, Macadamias and a Salted Caramel Pudding. 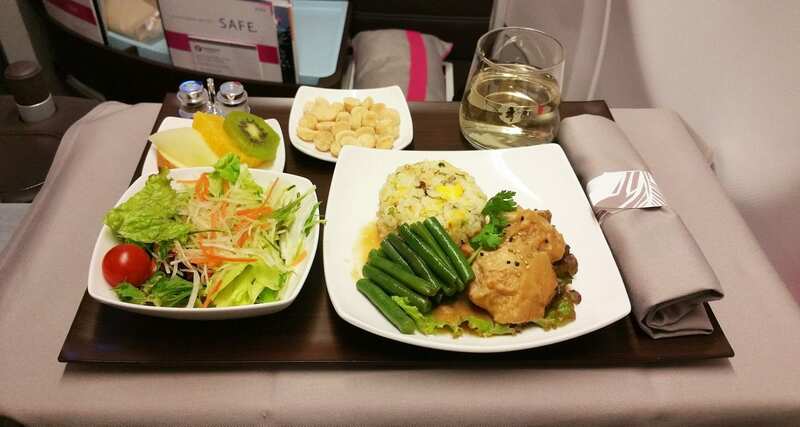 The first thing that I noticed was the fact that the cabin crew plated the main meal themselves, which is a nice touch and adds to that ‘restaurant’ experience in the sky. 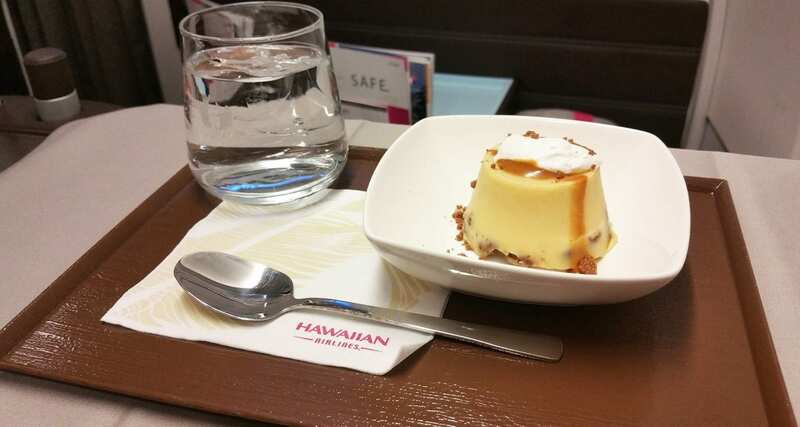 Some airlines will just serve stock standard pre-prepared airline meal plates to you in business class, but not on Hawaiian. The meal itself was tasty, the garden salad was fresh, and the yuzu dressing gave it a sweet, tangy/citrus taste. The main meal was delicious, the green beans didn’t taste overcooked at all, the chicken was tasty, and the salted fish kamameshi was delicious. Kamameshi is a traditional Japanese rice dish that’s cooked in an iron pot called a kama, and I loved this touch of Japanese cuisine as part of the meal. 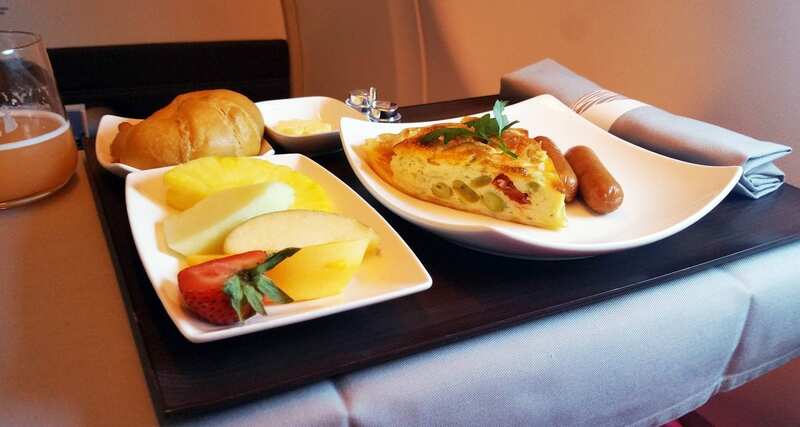 Before landing the crew started the breakfast service, however, there were two options here for passengers. The great thing about Hawaiian is that they offer you a continental breakfast up to 45 mins before landing. The breakfast was the right amount of food, not too little and not too much, The pastry wasn’t too oily, and the tomato/edamame combination was excellent, yet again I really enjoyed these tastes of Japan. Soon after the meal service, it was time for landing. 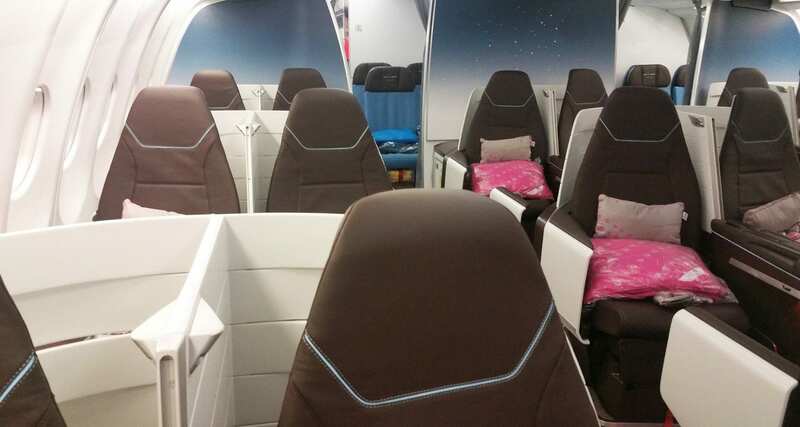 The biggest surprise of all, however, was towards the end of the flight, the cabin crew came through the cabin to offer everyone a Hawaiian inspired gift. What a nice touch. Shortbread cookies from the Honolulu Cookie Company. 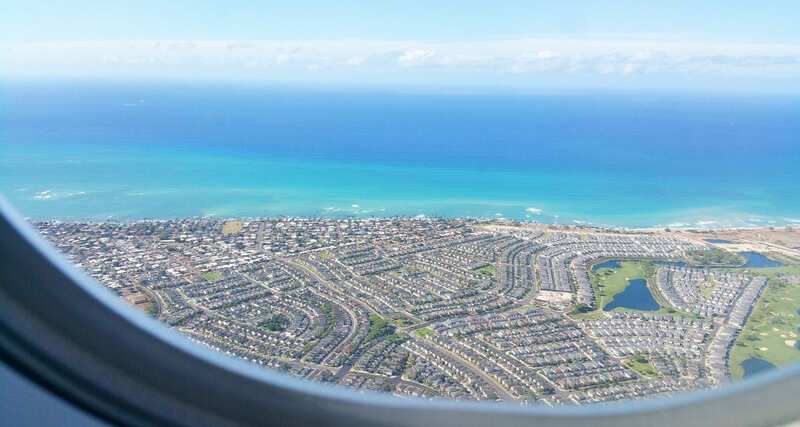 Several days later I flew onto Los Angeles from Honolulu and got to experience the airlines domestic First Class service, as it was a day flight the service was slightly different. Again a lovely welcome onboard, a choice of welcome drinks and printed inflight menus. 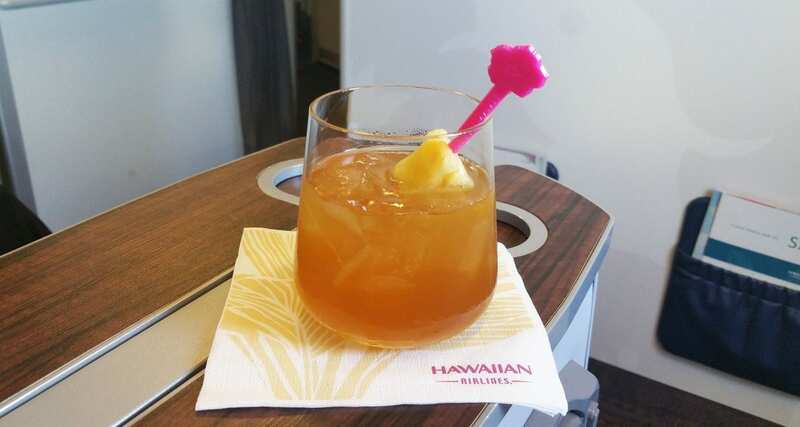 I had to try the signature Mai Tai drink, and it didn’t disappoint, in fact, I ended up ordering one more during my flight. 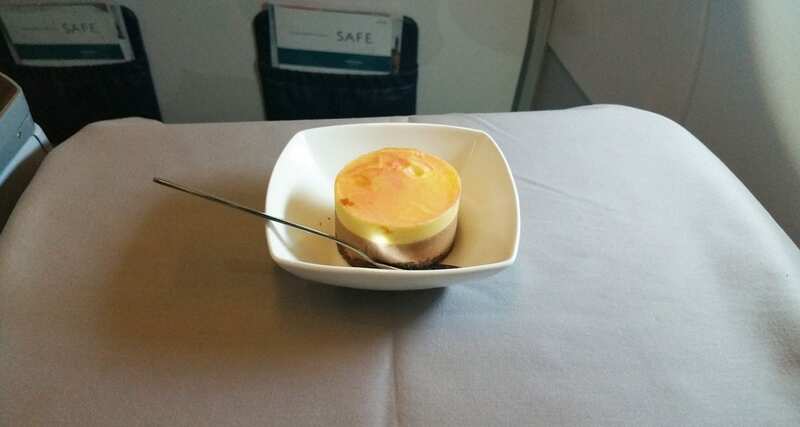 The service on this flight was slightly different to the night flight from Tokyo, this time you received your appetiser first, then the main followed by the dessert. For the appetiser, I selected the Kim Chee Shrimp option. Loved it and the mixture of different tastes also liked the fact that they used local Maui onions in the dish. Fresh, tasty and creative. For the main meal, I selected the udon noodle option. It was mouthwatering, the flavours of the ginger scallion pesto sauce coupled with the mushrooms and sesame sauce were fantastic. I enjoyed it, the noodles were zesty and were like I just had ordered them from a noodle stand. Delicious. Dessert was a lot better on this sector than the previous one, a simple passion fruit chocolate cake; it was on point. 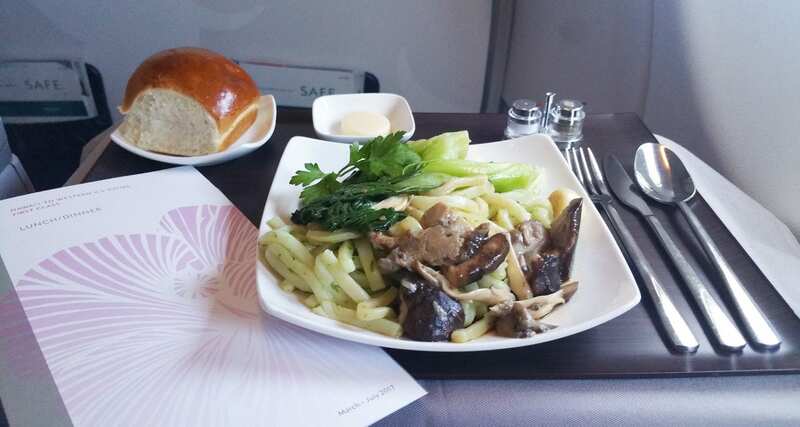 I enjoyed my inflight meal experience with Hawaiian Airlines; the crew were super friendly genuine and proud of their island home. The meals are carefully planned and highlight the island’s products where possible; I wouldn’t hesitate flying them again. I haven’t flown with that many US-based airlines but I think Hawaiian might be miles ahead of their competition, everything is well thought out and the crew are just so lovely!